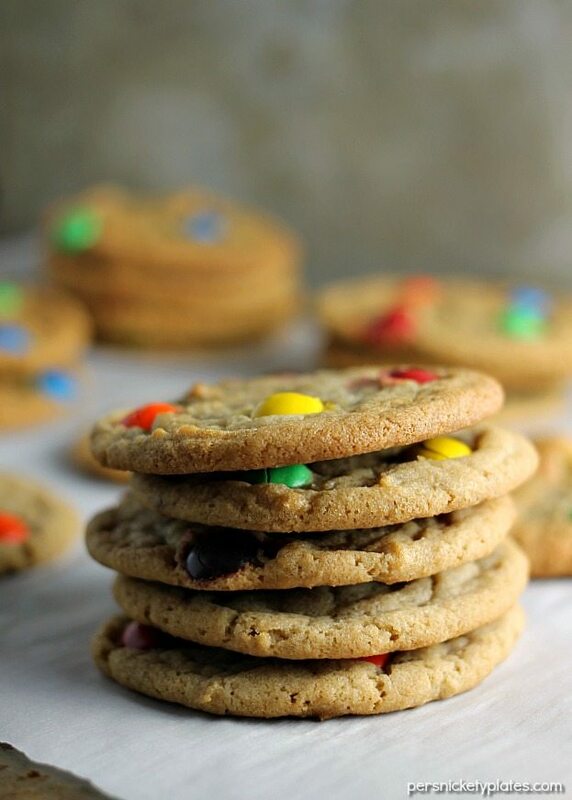 These Brown Sugar M and M Cookies from Persnickety Plates is a fun twist on the traditional sugar cookie. Chewy in the middle, crisp on the edges – just like a cookie should be! Going to the mall, I’m often tempted to swing by and get a cookie. My favorite is usually the Sugar Butter M and M but I have yet to truly replicate it at home. 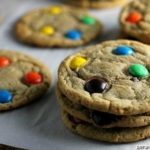 Instead, I thought it would be fun to use brown sugar in these Brown Sugar M and M Cookies instead of the standard white. Brown sugar is naturally moister which makes for a soft cookie. You end up with a super sweet cookie that is crisp on the edges and chewy in the middle. Just the way I like them. Is it spring where you are yet? I know talking about the weather is boring but as a blogger, I’m connected with people all over the country (and world!) and am constantly taunted by warm weather. I have so many blog friends in southern states and seeing families taking walks in sandals on social media has me green with envy. The other day it snowed 3 inches here in Metro Detroit. In April. We’re still in boots and winter jackets. I’m used to it, my birthday is the first week of April and the weather is nasty more often than not, but still. I want sunshine and warmth. Instead of outdoor activities, I stay in my kitchen and bake. At least it’s fun to do that when it’s crappy outside. Not great for my waistline, but good for my sanity. 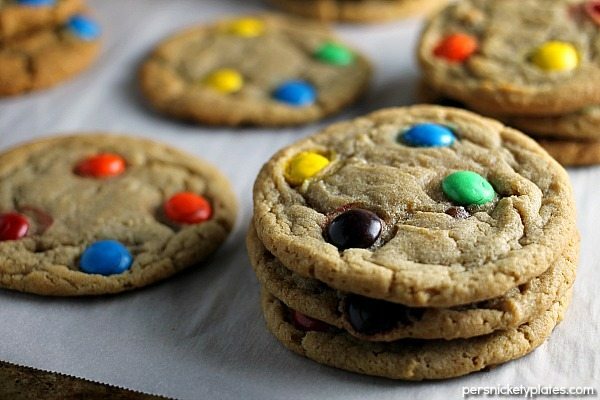 I guess I like cookies with M&Ms in them because I shared these Chewy M&M Brownie Cookies last year. I think, even more than the taste (which is great), I love the bright colors. They’re so fun in a cookie. Plus, they perk me up in my kitchen when it’s cold and gloomy out the window. 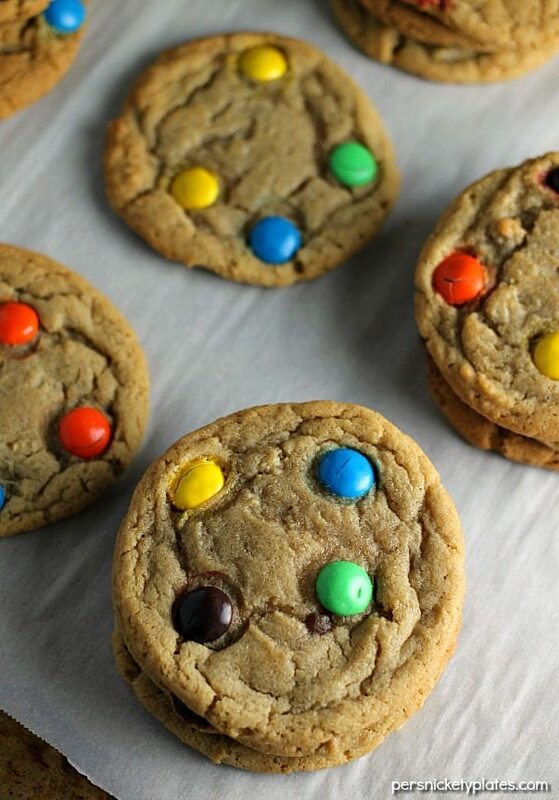 This Brown Sugar M&M Cookie is a fun twist on the traditional sugar cookie. In a large bowl, add the flour and baking soda and whisk together. In another large bowl (or the bowl of your stand mixer), add the butter, shortening, and brown sugar and mix until fluffy (a few minutes). Add in the eggs, beating well after each addition. Add in the vanilla and beat. Turn the mixer to low and scrape down the sides. Gradually add in the flour mixture, mixing only until the flour disappears. Cover bowl with plastic wrap and let chill in the fridge for at least an hour. Once chilled, preheat your oven to 350 degrees and line baking sheets with parchment paper or silicone baking mats. Use a medium cookie scoop to scoop out the dough and place 12 per baking sheet. Press 4-5 M&Ms into the top of each dough ball. Bake for 8-10 minutes or until just golden. Remove from oven and immediately slide the parchment paper onto a cooling rack to cool completely. It should make about 3 dozen cookies, depending on how large your cookie scoop is. 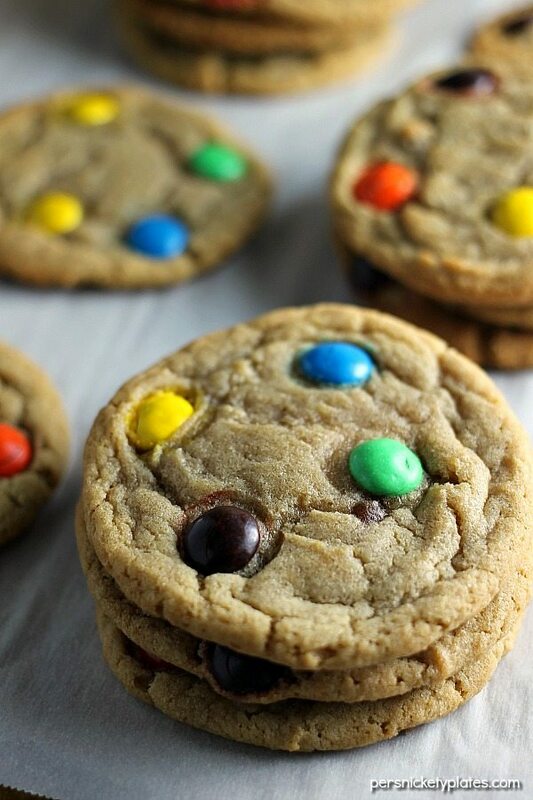 Don’t these Brown Sugar M and M Cookies just look so tasty?